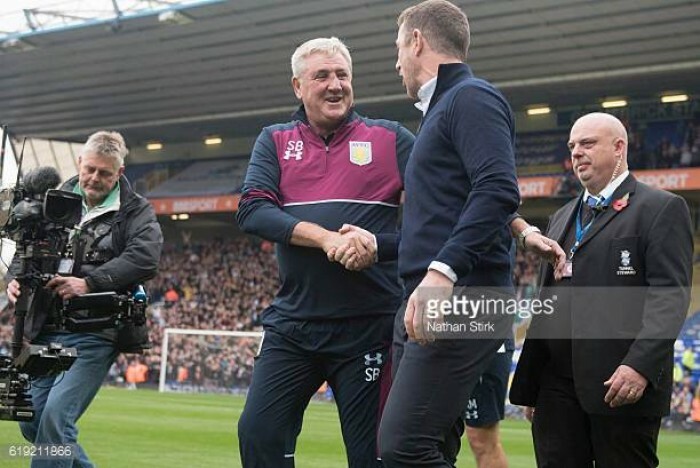 Bruce and Rowett (above) meet last season in the Birmingham Derby. Derby sit just one place in front of Villa, ahead of this weekend’s fixture and the two promotion rivals come into the game in good form. Derby County host Aston Villa in arguably the most anticipated game of the Championship weekend. With Derby County winning four of their last five, whilst in good goal scoring form - scoring nine goals in them games. Aston Villa are unbeaten in five, but have drawn their last two and will hope to get a positive result so they don’t drop away from Gary Rowett’s side and chances of promotion from the Sky Bet Championship. Rowett mindful of Villa’s strengths and threats. The same fixture last year ended 0-0 and even though both teams were under completely different management Gary Rowett has predicted more of the same. “I think it will be a cagey game, Villa will be mindful of our pace going forward and we will be mindful of their pace with the likes of Adomah and Snodgrass having the ability to create problems for any defence. Rowett went on to talk about his mindset in these ‘big games’. “The win against Middlesbrough was a marker, we don’t look at any game in the same light. Steve Bruce is looking forward to tomorrow’s big game. After last weeks disappointing draw at home to Millwall, Bruce wants a reaction from his players in a big test. As for Derby’s starting eleven, Rowett stated “there will be defiantly one change due to Tom’s [Lawrence] injury. Other than Lawrance’s absence Rowett is embracing the hard task of picking an eleven with a nearly fully fit squad. Villa aren’t as fortunate with captain John Terry out for another two weeks, but Bruce is happy with the speed of his continued recovery. Andre Green is another absentee, he is due back to full training early next week. He is joined by Chris Samba (hamstring), Henri Lansbury (tight from Millwall game) and Alan Hutton (out due to a knock in training).